I was really, really bored today. I had just built a rather large bridge connecting 1 castle to a miniature one, and also built 2 minecart tracks, each utilizing a different bug to send them on their merry way up a gigantic cliff back to the castle. I was pretty tired of the normal, so I loaded up a new map and gave myself 1005 tnt, 20 red dust, 5 pressure plates and a LOT of patience. I dug a 10x10x10 cube in the ground, filled it up with tnt, and planted 5 tnt/red dust/pressure plate systems around the corners and in the middle. Set the difficulty to peaceful and waited. I was prnt screening the whole time, but forgot screenshots aren't saved, so I only have the very last picture (the aftermath). Anyways I built a large tower, and watched. Two sheep, a few pigs and a cow all wandering in the general vacinity. I was hoping for the lone cow to step on one but no luck. 5 minutes later, still nothing. I got tired, so i punched them all directly ontop of the massive cube of tnt and waited. 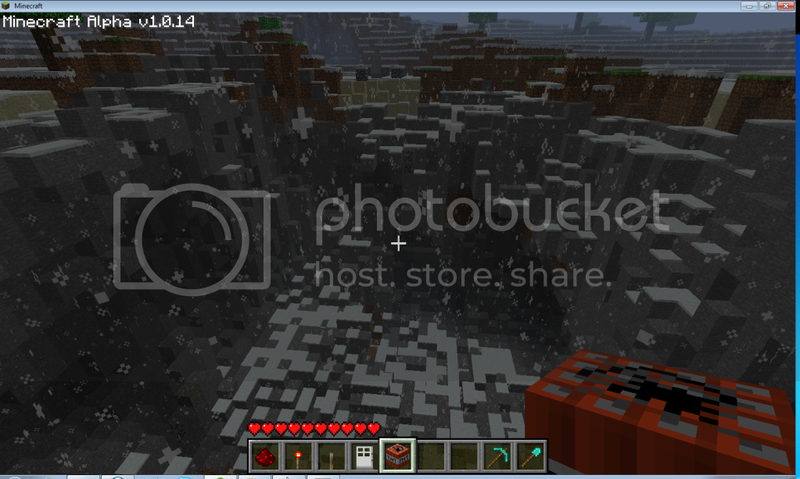 Finally a pig stepped on it long enough to trigger one of the tnt blocks, and I laughed. Boom went the first. It triggered another 20. Then 200. Then the other 700 or so went off. I had a pretty big smile ( still thinking my pictures would make an epic comic ). Then I saw a cow. And a pig. Another pig. 1000 tnt, and only 1 sheep and 1 or 2 pigs. Sad face. Post your failed/funny/ridiculously successful traps. Also - what 1000 tnt does to the earth. Not a whole lot actually. Sheared a sheep, killed a cow, and a pig.